Black Veil Brides is an American rock band based in Hollywood, California. The group formed in 2006 in Cincinnati, Ohio and is currently composed of Andy Biersack (lead vocals), Ashley Purdy (bass, backing vocals), Jake Pitts (lead guitar), Jinxx (rhythm guitar, violin) and Christian "CC" Coma (drums). 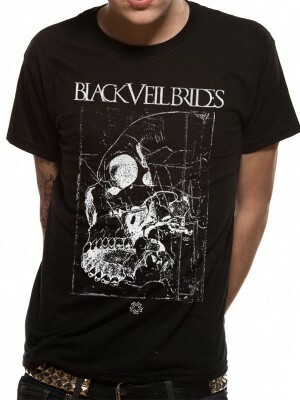 BLACK VEIL BRIDES T-Shirts which we offer at Plain-t-shirts.co.uk forms part of our movie, games and music official merchandise range. BLACK VEIL BRIDES range we offer fast delivery all over UK/EU BLACK VEIL BRIDES - SIDE SKULL (UNISEX) which we offe..
Black Veil Brides are known for their use of black makeup, body paint, tight black studded clothing, and long hair, which were all inspired by the stage personas of KISS and Mötley Crüe, as well as other 1980s glam metal acts.